Product #48057 | SKU 21905 | 0.0 (no ratings yet) Thanks for your rating! 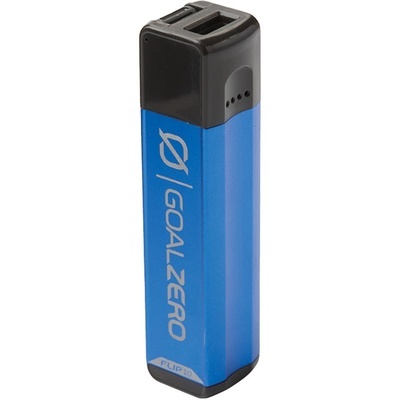 Add extra power to your mobile device with the Photo Blue Flip 10 Recharger from Goal Zero. This portable charger features a 2600mAh battery capacity that's designed to give an additional charge to compatible smartphones. The Flip 10 can be charged from any compatible USB port using the included micro-USB cable or through solar energy using any compatible solar panel (sold separately). Pass-through charging technology allows you to charge both the Flip 10 and the device it's powering at the same time. The Flip 10's 2600mAh capacity is designed to give your phone up to two full phone charges. Charge up on the go from Goal Zero's line of portable solar panels (sold separately). Charge the Flip and a phone at the same time. The Flip 10 can be charged by connecting a compatible solar panel, such as the Nomad 7 Solar Panel, which recharges the Flip 10 in 2.5 to 5 hours. The Flip 10 can also be charged by being plugged into a USB power source.